Do have some spare time this weekend and want to do something productive? Now is the ideal time to spice things up in your kitchen with these five quick, easy and budget-friendly DIY kitchen project ideas you can achieve in a weekend. DIY is all about making the most of the materials you have on hand and getting stuck in. The following ideas are merely a springboard to provide big inspiration for your next small kitchen project. They are designed to be tailored to suit every space and style, using whatever materials are sitting, unused and forgotten, in that bottom drawer. A number of studies have shown that indoor plants reduce stress and improve productivity, concentration, sleep patterns and general well-being. So why not bring some life into your kitchen and reap the additional health and culinary benefits as well? There are plenty of herbs that thrive indoors for you to choose from. Basil, chives, parsley and oregano are among my personal favourites. Impress friends and family with your cheese and chive scones, pesto or Margherita pizza made using fresh, home-grown ingredients! Indoor herbs do best sitting on a windowsill where they get plenty of sunlight. Depending on the space available, you can divide each plant into individual pots or keep them all in a single trough. Those old terracotta pots in the garden shed (or new ones) are among the best for drainage – liven them up with a lick of paint or varnish. If you are handy with a hammer, build your own mini-garden from scratch out of plywood, which allows you to design a shape and size to fit your kitchen best. 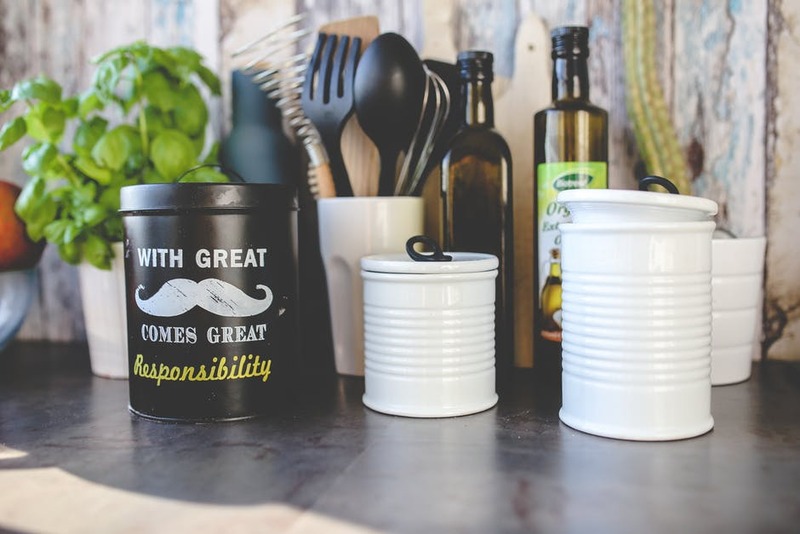 Alternatively, if you are one of those people for whom hammers are to be treated as a hazardous substance, individual pots can be created out of tins, glass bottles, mason jars, upside down two-litre plastic bottles, cookie tins, tea cups or teapots. Have you ever discovered at 7am that a beloved family member has used up the cereal and forgotten to mention it? After you have done the weekly grocery shop? It is infuriating. A DIY chalkboard shopping list is both a solution to lost lists and a quirky way to repurpose dull, empty wall space. Most paint and hardware stores stock chalkboard paint that dries with a classic chalkboard finish in a variety of colours. The fun begins as you choose your background surface, from a simple piece of plywood or an ornate frame to a wooden chopping board, old flat-bottomed tray or clipboard for something a little more unique. Paint a cupboard door or an entire wall if you dare! For a less messy alternative, you can use self-adhesive blackboard paper. This generally comes in rolls that you can then cut into shapes, peel off the backing and stick on. If you are one of those talented people who do not lose their shopping lists or have perfect recall, consider creating a chalkboard calendar, message centre or quote board instead. Handy hint: remember to attach a chalk holder, such as a pot or tin, build a ledge, or even keep an old, chipped teacup nearby to ensure chalk is close at hand when you suddenly remember something to write down! Before you skim over this suggestion with a roll of your eyes and a horrified groan, consider these quick, ingenious and yes, even fun DIY storage solutions to help organise your kitchen. a) On the counter: Sort your most used utensils into containers. Consider upcycling jars, large mugs, plant pots, tins and vases. Personalize these or create a matching theme using paint, labels or stickers. b) On the wall: Coat hangers, an old rake, a piece of driftwood or broomstick can all act as hangers for those unwieldy pots, cups and spoons. Your chosen item(s) can be easily fastened to the wall using nails, picture hooks and/or cord. While you are at it, be brave and throw out, repurpose or donate unused utensils. Your future self will thank you for it. See your kitchen in a whole new light. Lighting is especially important in the kitchen so it may be time to install bigger, better fixtures. Try something more sleek and modern, or turn back the clock a few years and try something vintage or retro for a more classic, homely feel. Simply switching the light shade on dangling fittings can have dramatic effects. An upside-down colander light shade creates star-like patterns on the ceiling. Mason jars, cake tins or even graters can also be used to great effect and introduce a whole new vibe into your workspace. Before you begin, please be aware that this type of project may require a little more experience than others on this list, as it may involve either metal or glass work and some electrical know-how. For those that are in search of a more drastic change. New paint on cabinet doors can leave your kitchen feeling clean and new, without needing expensive tiling or new tapware. Feature walls have continued to be a popular choice in recent years, so be brave and paint that back wall fire engine red, or add accents with contrast edging. Alex Kennedy is the digital marketer for Plumbing Plus, Australasia’s leading supplier for plumbing and bathroom supplies, offering a wide range of products from shower enclosures, toilet suites, basins, and sinks, to water heaters, gas heaters, and other accessories. You can check out their collection of products from leading brands in one of their stores across New Zealand, or shop online at their website. Your ideas are really great! Thanks for sharing them with us. I like your lighting tips and would implement them for my kitchen.